I have been making flaxbread since just a couple weeks after I started keto. I love the stuff, and it is very easy to make. My BF and I go through a batch of the bread probably every week or every other week. It's great for sandwiches, but our favourite time to enjoy it is with our breakfast. 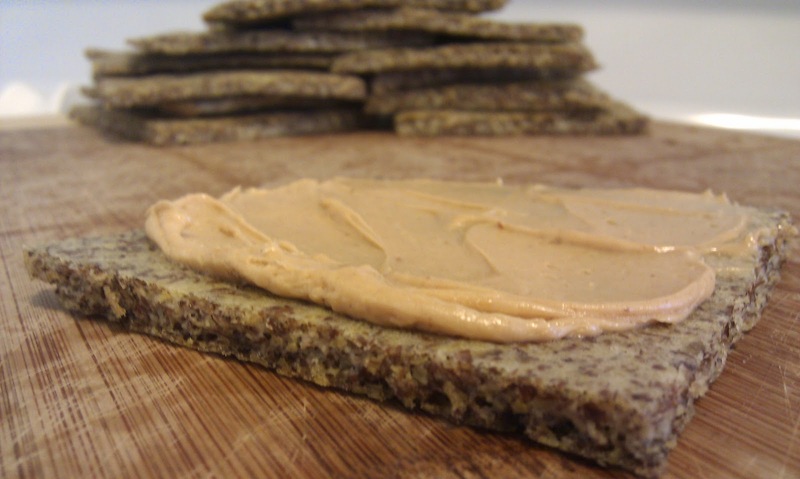 It's perfect for toasting, and tastes great with a bit of peanut butter! I first made flaxbread using this recipe but I have since adjusted it several times, finally coming out with the recipe I'm about to share with you. The bread that comes from this recipe is thinner and lighter (my preference) than the bread that comes from the linked recipe. If you like thick bread by all means try the other recipe, too! A nice warm piece of flaxbread and a bit of whipped peanut butter. Mmm! Since this is so quick and easy, you'll want to preheat your oven and prep your pan first. 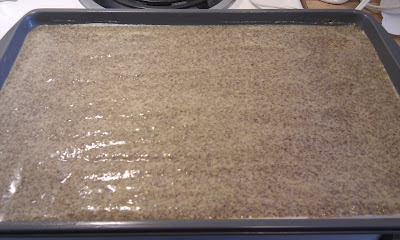 Preheat your oven to 350F and line a baking sheet with parchment paper. 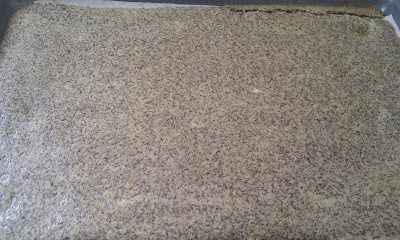 Grease the parchment paper as you would if you were just using a baking sheet. I used Pam Baking Spray. 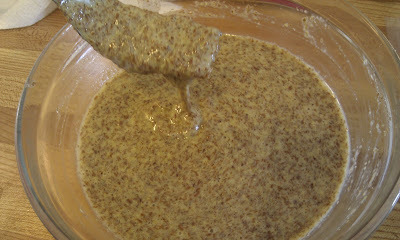 In your bowl, mix the dry ingredients and then add all the wet ingredients and stir until completely blended. You can use a fork, whisk, or a hand mixer for this task. 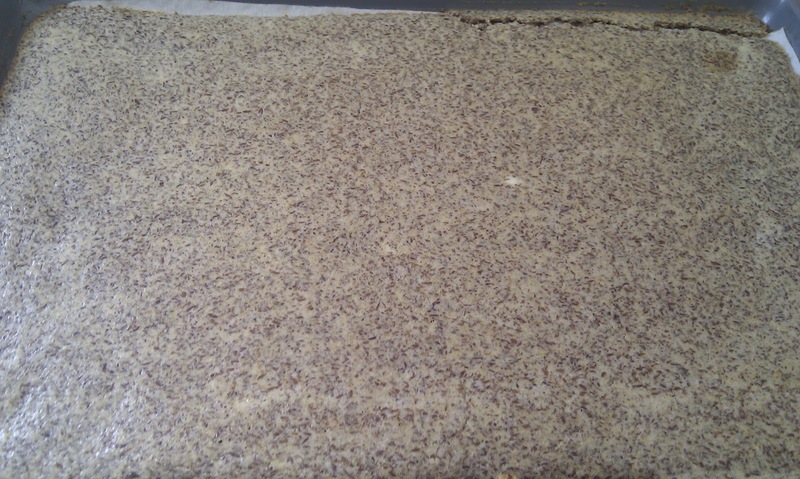 Immediately dump your batter into your lined (and greased) baking sheet and spread the batter from edge to edge. Try to make it even, if you can. Bake your bread for 17-20 minutes. Immediately after removing the bread from the oven you'll want to make sure all the edges of the bread are free from the sides of the pan and carefully flip the baking sheet upside down on a cooling rack or cutting board (or something). To do this, I typically put the rack or board on top of the baking sheet hold the two together, then flip (don't forget to wear your oven mitts!). Remove the parchment paper and discard it. I didn't unstick the edges! This step can be done whenever you feel like it, but I do it right after flipping and removing the paper. Slice your bread into 12 roughly even slices! Let the bread cool completely before storing. Refrigeration is optional, though it will keep much longer if you do refrigerate it. If you live somewhere hot and humid, refrigeration is not optional - you must keep it cooled! And there you go, that's my recipe for flaxbread! Alright so I've finally started up my very own food blog. No, I'm not some special chef or aspiring chef or anything like that. I just really f*cking love to cook. I am going to start off by telling you a bit about myself and why I even want to do this blog. Well, I'm a 2nd year university student and I'm not at a healthy weight, or even anywhere close to where I want to be. So a few months ago I started a diet (the keto diet!). At first, I wanted to take it slow and be cautious etc, so I started by cutting out all fast food and sugary beverages from my diet. But I am a pretty impatient person. After about a week I took two boxes into my kitchen and went nuts on my fridge, cupboards, and pantry. One box was crap to go in the trash (things that would rot pretty quick but that I couldn't eat anymore) and the other was things to give to people. Afterwards, my partner and I went grocery shopping to satisfy a keto-friendly (we refer to keto-friendly things as "safe" foods) grocery list. We have been on keto for about 3 or so months now... I lost track after school started. I have a great support group over at r/loseit and without them I would have fallen off the wagon a few times. But what keeps me going on keto the most is how much I really f*cking love to cook. Starting a new diet means I not only need to learn new ways of eating, but I get to explore recipes and try things I never would have thought to try before! I am always on the prowl for new recipe ideas, and I especially love experimenting with baked goods. Typically, I will make a recipe 3 or 4 times with adjustments before I will share it with anyone. To make a long story short, I've collected so many recipes and I have so many people asking for ideas that I wanted one easy place to keep them all. So here I am. I also want to include a page on this blog for my progress - it won't be anything big or dramatic, just some updates about how much I've lost or what new victories are, etc! (By the way, I've lost 28.5lbs so far). Oh yea, I use MyFitnessPal every day (usually). If you would like to add me, please feel free! My name there is jjmah89. You can leave comments here or message me on MFP if you want to get in touch with me.